A deaf woman who is five months pregnant says a man punched her in the stomach and hit her service dog during a confrontation on an airplane as it arrived at an Orlando airport. Hazel Ramirez says she and her partner, Matthew Silvay, were confronted Thursday by Timothy Manley, who objected to their service dog, Zariel, a Great Dane. 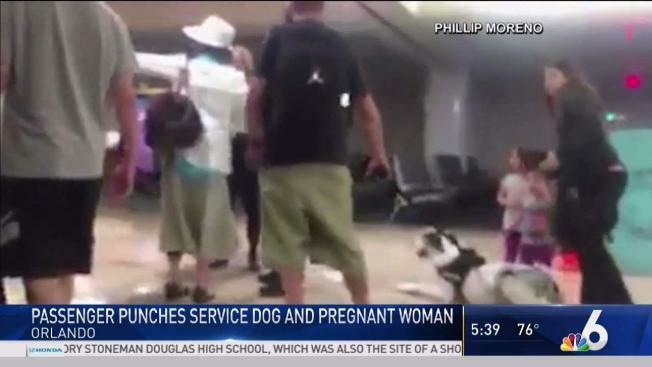 A deaf woman who is five months pregnant says a man punched her in the stomach and hit her service dog during a confrontation on an airplane as it arrived at a Florida airport. Manley says the dog triggered his wife's allergies as the flight from Colorado Springs to Orlando was making its descent.